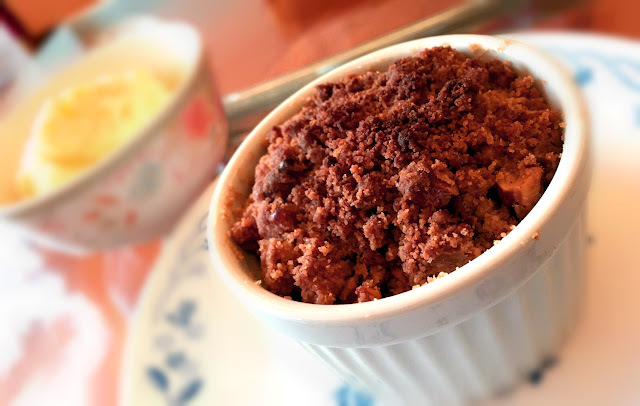 This is a very good apple crumble recipe shared by my friend CKY. The toppings are crunchy and I particularly like the addition of walnuts. It is a MUST for this recipe. This is simple and can’t really go wrong as you serve it warm with vanilla ice cream! Preheat oven to 400 F. In a medium bowl, mix together flour, walnuts, 1.5 tbsp white sugar, brown sugar, 1/4 tsp cinnamon, nutmeg, and salt. Pour melted butter into dry ingredient mixture. Mix with a fork until blended into large chunks. Set aside. In a separate bowl, toss apple cubes with the rest of white sugar (1.5 tbsp) and cinnamon (1/2 tsp). Divide the apples among 4 ramekins and top each with the crumb mixture equally. Bake for 30 -35 min until the apple is soft and the topping is browned. Best apple crumble I have ever tried... Can't have enough!! Thanks for the support!! haha!